We always buy too many croissants. I think it’s because whoever’s up first likes the idea of the little excursion to the bakery. But in reality, my father breakfasts frugally on an abstemious bowl of cereal, my sporty brother and sporty nephew like the protein hit of huge omelettes, I eat what I eat at home, yoghurt and fruit, Séan cruises what everyone else is having and picks out what he likes best. My mother dines luxuriantly on the worry that everybody has exactly what they want, that it’s not too hot, not too cold, that it’s just right. So we often have croissants left over. This morning I made eggy bread, french toast, pain perdu, whatever you’d like to call it, from yesterday’s poor, overlooked specimens. This is so easy it’s barely a recipe, but it does make a very fine breakfast. On that at least we have an early-morning consensus. You could also add some vanilla if you like, or use lemon zest in place of the orange zest. Icing sugar, to dust, though I don’t have any here so I didn’t. 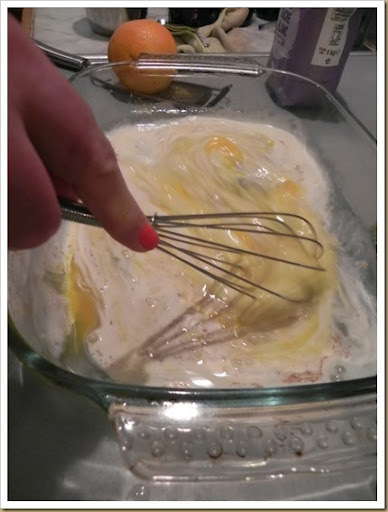 Whisk together the eggs, milk, cream, zest, cinnamon and salt in a wide, low dish. Put the croissants into the custardy mixture, cut-side down, for about 10 minutes. Turn over and leave to soak for another 5 minutes. Warm the butter in a large, non-stick frying pan over a medium heat. Fry the croissants until golden, about 3 minutes per side. 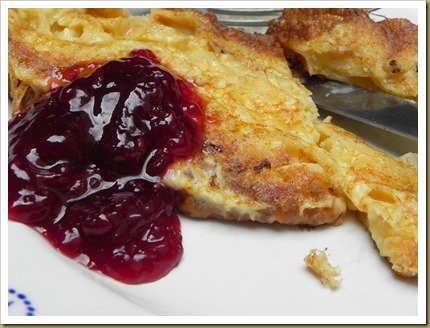 Serve dusted with icing sugar (add a bit more cinnamon to the icing sugar if you like), with maple syrup or jam. A summer evening in the Languedoc. Tomorrow morning, Séan and I set off on our annual drive to the south west of France. That’s just the 16 marriage-enhancing hours, door to door. It’s a modern Kerouacian romp of shouting at the SatNav and arguing over whether the dog needs a wee. Service stations are where whimsy goes to die, or at least to stock up on wiper blades and pallid chips, where low aspiration and low blood sugar meet, and weary, glazed eyes seek out sticky glazed doughnuts to fill the hungry gap between now and inevitable Type 2 diabetes. I don’t know about you, but that doesn’t say ‘holiday’ to me. Due to our (my) desire to be on holiday as soon as possible, we don’t stop much. We rely for sustenance on a hastily-scrabbled-together-at-dawn holiday picnic of egg-and-cress sandwiches, salt-and-vinegar crisps, fruit, perhaps some leftover pie or cake, sturdy biscuits which will withstand being rattled about in the car, bottles of water and a huge thermos of coffee. Of course, some take en route sustenance very seriously indeed. You know when you get on a plane and your neighbour suddenly produces a linen napkin and a beautiful bento box filled with sushi? You never want to sit next to that person. They would be no use at all if there was An Incident. For example, if we were suddenly required in the cockpit to fly the plane, she would be unavailable to take instructions from air traffic control due to an urgent need to remove the wasabi stain from her three-ply dodo wool sweater. I am a great believer in the redemptive power of the snack, but it doesn’t do to be too precious. Contrary to what many a modern calendar/mousemat/comedy mug/inspirational postcard might have you believe, sometimes it really is the destination not the journey. These are made from browned butter, which gives them a deliciously sweet and nutty flavour. They are a plainish biscuit, which is generally my preference. You can even leave out the rolling in sugar part if it offends your abstemious nature. 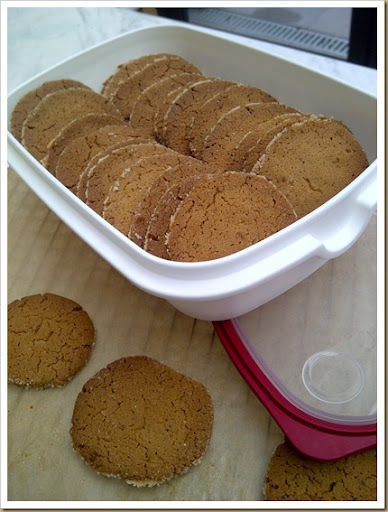 They’re the sort of thing you can make when the cupboard’s practically bare and they last for ages in a tin. Perfect for a road trip. If you have one of them in your future this summer, you should try them. Roll them in sugar, or not. In a small, heavy-bottomed saucepan melt the butter over a medium heat, stirring frequently, until the solids go a deep golden brown and it has a rich, sweet, nutty aroma – it really will smell delicious. This should take about 6-7 minutes. Hold your nerve. Immediately pour the butter into a medium-sized mixing bowl to cool and stir in the vanilla. Beat in the sugar until well combined and glossy. Beat in the whole egg and one egg yolk. In a separate bowl, whisk together the flour, bicarbonate of soda, baking powder and salt. Gradually beat into the butter and sugar until you have a smooth, firm dough. Divide the dough in two. Roll each piece into a log about 5cm wide. Wrap in cling film and refrigerate until firm, at least an hour. At this point if you like, you can freeze one of the batches of dough. Preheat the oven to 180C/350F/Gas 4 and line some baking sheets with baking parchment. 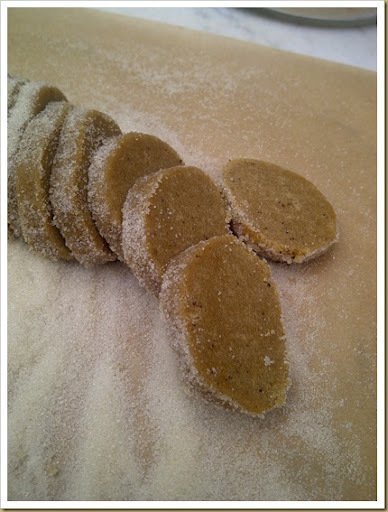 If you are rolling the biscuits in sugar, scatter and few tablespoonfuls onto a sheet of baking parchment. Lightly beat the remaining egg white with a teaspoon of cold water and brush the dough with the egg wash before rolling in the sugar. Slice the biscuits into 5mm rounds and place on the baking sheets – leave a minimum of 2cm between each biscuit as they spread out a bit. Bake until firm and golden, about 15 minutes. Cool for a couple of minutes on the baking sheets before removing to a wire rack to cool completely. They will keep for about a week in an airtight tin. When we were here a couple of years ago, I wrote about my rugby-playing nephew Angus who was supposed to eat 4,000 calories a day and seemed keen to derive a fair amount of these from Nutella. Well – despite a startlingly grown-up beard – he still has a child’s sweet tooth and an enduring affection for the chocolate and hazelnut spread. 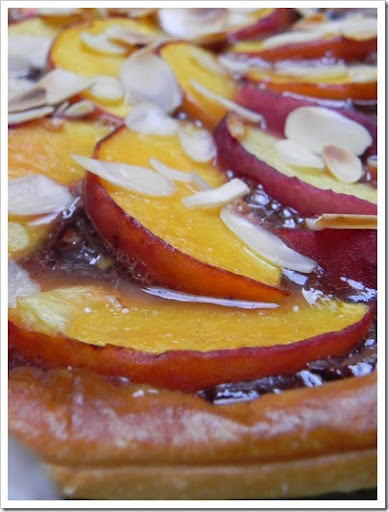 Last night we needed a quick sweet fix to round off dinner and together we came up with the 5 minute Nutella and peach tart. For a lazy tart, it’s not bad. Not bad at all. Line a baking sheet with baking parchment (or use the parchment the pastry comes rolled in) and lay the circle of pastry on it. 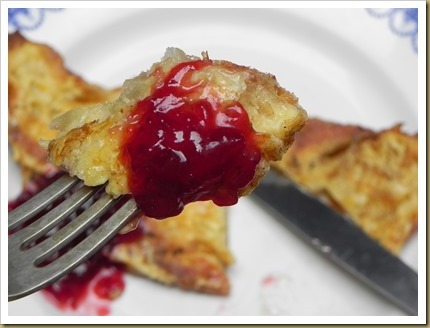 With a small, sharp knife, cut a border about 2cm in from the edge of the pastry disc, being careful not to cut all the way through the pastry. 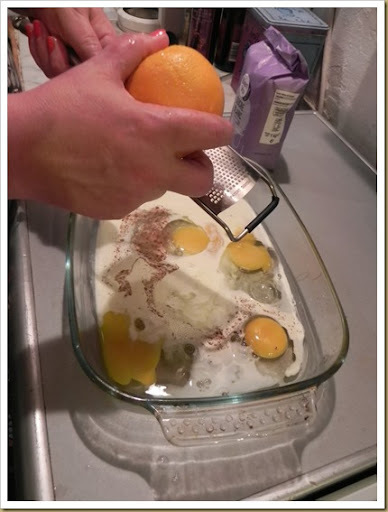 Brush the border with the egg wash or milk. Using a spatula, spread a generous, even layer of Nutella within the border and arrange the sliced peaches over the top, cramming them quite close together. 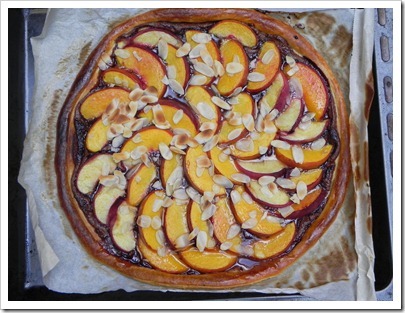 Scatter the nuts over the top if using and then bake for about 20 minutes, until the pastry if puffed up and golden and the peaches are slightly caramelised around the edges. Serve warm. Agde has been hot – the kind of humid heat that interferes with sleep, melts make up, frizzes hair. On the terrace of the Café Plazza, as tinny, consumptive Peter Gabriel or Police wheezed out from the speakers, locals muttered about ‘un orage’ over tiny cups of coffee and breakfast beers. 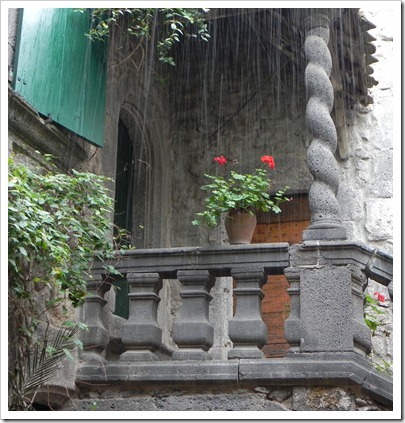 Well today the orage came, splashing, running, pelting down from the skies, spilling from the gutters, filling the age-smoothed grooves in the basalt terrace like tiny rockpools. It was a day to remain behind the wooden door. 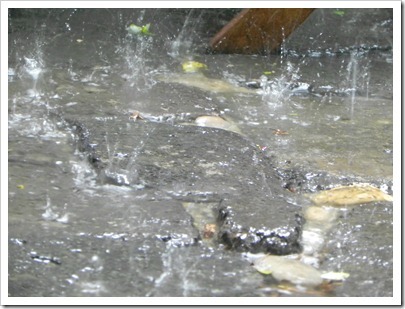 Rain splashing on the basalt terrace. Almost the very second we were due to leave London, the car rammed to the rafters with towels and straw hats, proper pillows, paperbacks and favourite knives, the postman delivered a parcel, a birthday present from my sister-in-law. It was Dorie Greenspan’s lovely Around My French Table. It was my companion throughout our 17 hour journey, especially during the boring bits before you get to Clermont Ferrand where France begins to roll downhill to the south. I gave the book to my nephew Angus to look at and told him we could make what he liked. He’s going to university in the autumn (biochemistry – what the hell?) and wants to learn to cook a bit. 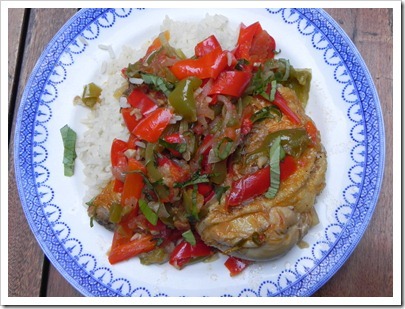 His mother’s from a Spanish Basque family so his heart, appetite and genes lead him to Dorie’s Chicken Basquaise, a colourful jumble of peppers, chillies, tomatoes and chicken, a perfectly sunny dish for an extravagantly rainy day. If you’re keen on French food, you really need to buy Dorie Greenspan’s book. Probably today, if it’s not too much trouble. In her introduction, she says ‘This is elbows-on-the-table food, dishes you don’t need a Grand Diplôme from Le Cordon Bleu to make’. ‘Elbows-on-the-table food’ is a pretty good description of the food I love and so many of my favourites are here, a whole banquet of rillettes, gratins, daubes and gougères, but also couscous and tagines, escabeches and ceviches, reflecting France’s more recent influences and passions. Around My French Table is the kind of book you want to work your way through, devouring every carefully, cheerfully, deliciously constructed recipe. The recipes use American measurements, but you can buy cup measures all over the place now so that’s hardly an obstacle to enjoyment. To make the pipérade: Cut the onions in half from top to bottom. Lay each piece flat-side down and cut in half again from top to bottom, stopping just short of the root end: cut each half onion crosswise into thin slices. Put a Dutch oven or large, high-sided frying pan with a cover over medium heat and pour in 2 tablespoons of oil. Warm the oil for a minute, then toss in the onions and cook, stirring, for 10 minutes, or until softened but not coloured. Meanwhile, cut the peppers and chillies in half, trim the tops, remove the cores and remove the seeds. Cut the peppers lengthwise into strips about ½ inch/1cm wide. Thinly slice the chillies. Add the remaining tablespoons of oil to the pot, stir in the peppers and chillies, cover, and reduce the heat to medium-low. Cook and stir for another 20 minutes, or until the vegetables are quite soft. Add the tomatoes, garlic, salt, sugar, thyme, bay leaf, piment d’Esplette or chilli powder, and freshly ground pepper to taste, stir well, cover and cook for 10 minutes more. Remove the cover and let the pipérade simmer for another 15 minutes. You’ll have a fair amount of liquid in the pot, and that’s fine. Remove the thyme and bay leaf. Taste and add more salt, pepper, or piment d’Esplette if you think it needs it. 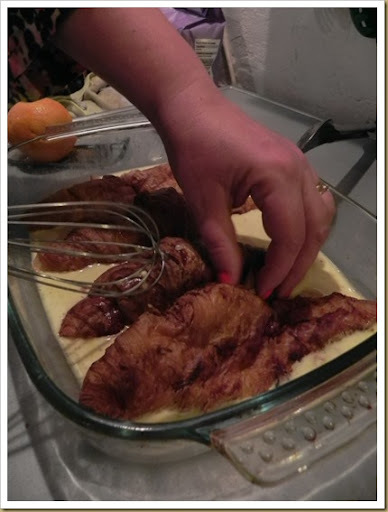 If you would like to make the pipérade with eggs (see below), use a slotted spoon to transfer 2 cups of the pepper mixture into a bowl. Spoon in a little of the cooking liquid, and refrigerate until needed (you can pack all of the pipérade in an airtight container and keep it refrigerated for up to 4 days). To make the chicken: Pat the chicken pieces dry. Warm the oil in a Dutch oven or other heavy casserole over a medium-high heat. Add a couple of chicken pieces, skin-side down (don’t crowd the chicken – do this in batches), and cook until the skin is golden, about 5 minutes. Turn the pieces over and cook for another 3 minutes. Transfer the pieces to a bowl, season with salt and pepper, and continue until all of the chicken is browned. Discard the oil, set the pot over a high heat, pour in the wine, and use a wooden spoon to scrape up any bits that might have stuck to the bottom. Let the wine bubble away until it cooks down to about 2 tablespoons. 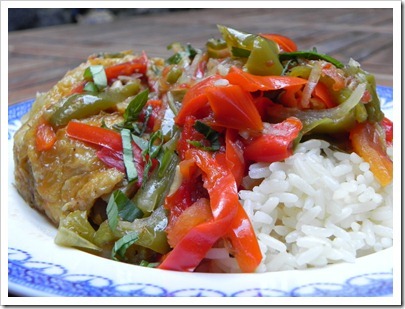 Return the chicken to the pot, add any juices that have accumulated in the bowl, and spoon in the pipérade. Bring the mixture to the boil, then reduce the heat so that the pipérade just simmers, cover the pot, and simmer gently for 40 minutes, or until the chicken is cooked through. Taste for salt and pepper and adjust the seasonings as needed. Serve over white rice, sprinkled with basil and/or cilantro/coriander, if using. The traditional way to make pipérade and eggs is to heat the pipérade, stir beaten eggs into the mixture, and cook until the eggs are scrambled. Inevitably and invariably the egs curdle, but no one (at least no one Basque) seems to mind. If you’d like uncurdled eggs, warm 2 cups of pipérade in a saucepan. Meanwhile beat 6 eggs with a little salt and pepper in a bowl. Heat 2 tablespoons of butter in a large, non-stick pan over a medium heat, and when the bubbles subside, pour in the eggs, Cook the eggs, stirring, until they form soft curds. Spoon the pipérade into four shallow soup plates and, with the back of a spoon, make a little well in the centre of each. Fill each well with some scrambled eggs. 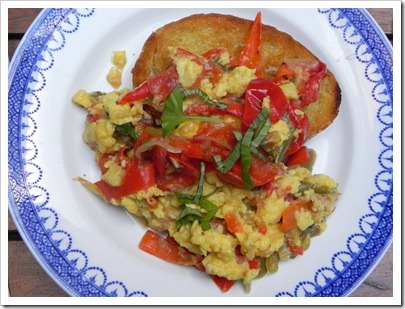 Drizzle the eggs and pipérade sparingly with olive oil, dust with minced basil or coriander, if you’d like, and serve immediately, with slices of warm toasted country bread rubbed with garlic and moistened with oil. Well the sun came out and, in the fickle way of holiday makers everywhere, I’m grateful for the house’s fortress-like basalt walls which keep the rooms shady and cool. Even on the brightest days, inside you need to turn on a light to read. 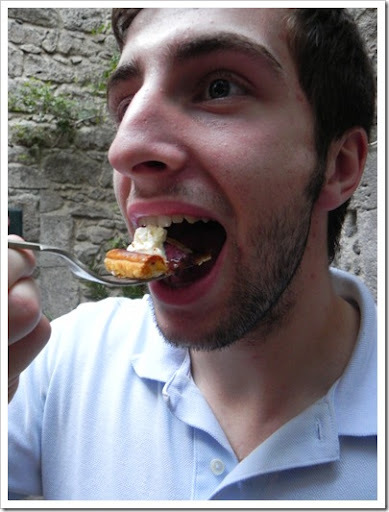 June is one of the happiest and most delicious of months in Adge. The market is full of peas and peaches, melons, tomatoes and cherries, everything du region. 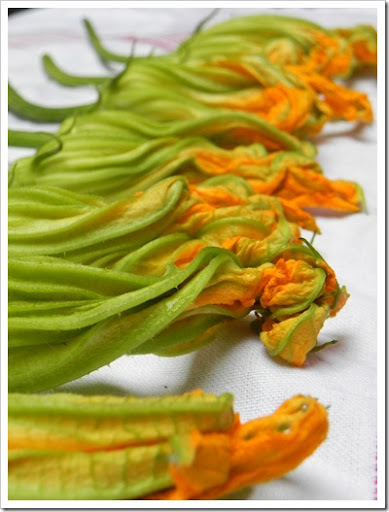 At one of my favourite stalls, a young man was selling courgette flowers. I bought all he had, about twenty or so, and from another stall enough soft goat’s cheese to stuff them. Forgive me, TS Eliot, for saying that I measure out my life in measuring spoons. Quarter of a teaspoon, half a teaspoon, a teaspoon; half a tablespoon, a tablespoon. When I’m developing recipes, accuracy is everything. Measure and measure again. So when I’m on holiday, one of the purest of pleasures for me is to scatter, toss, fling ingredients around with a recklessness that would get me fired in my real life. Here, it just gets me fired up. So you need to forgive me, too, for having no proper measurements in this recipe. But hey, you’re a clever sort, you can figure it out. 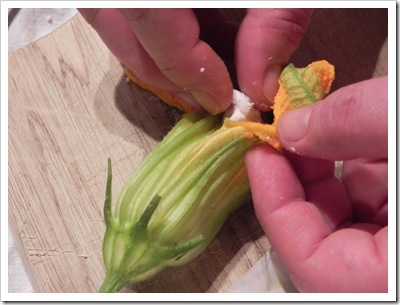 Carefully peel back the petals of the courgette flowers and remove the stamens. Take a bit of soft goat’s cheese (I was going to say about a teaspoonful, but we’re doing this freestyle, no measuring aren’t we?) and tuck it inside each flower, twisting the petals to close around the cheese. Pour about 10cm of oil into a heavy-bottomed, deep pan. It shouldn’t come more than a third of the way up the sides. Heat up the oil until it measures 180˚C on a thermometer, or, as we’re on holiday, a cube of bread turns golden in just less than a minute. While it’s heating up, make the batter. In a bowl, mix the flour with a good pinch of salt and enough mineral water to give it the consistency of double cream. I like to throw in an ice cube too, to ensure it’s extra cold. 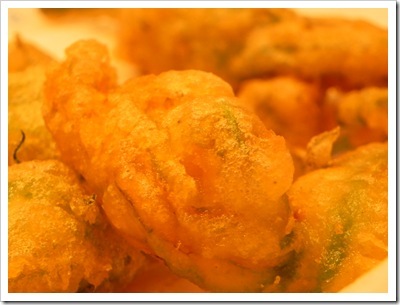 When the fat is hot enough, dip the flowers by their stems into the batter and then carefully drop them into the oil. Don’t crowd the pan – in mine, I can cook about four at a time – and cook until golden, about 3-4 minutes. Scoop the cooked flowers out of the oil with tongs or a spider and leave to drain on kitchen paper while you cook the rest. Serve immediately, sprinkled with a little salt. In June, you don’t expect the sky over Agde to be as dark as the sombre basalt slabs that form its pathways and quayside. The grey stones undulate like ripples on the Hérault river, worn smooth by centuries of footsteps and pockmarked with ancient volcanic bubbles. No matter. We’re holed up behind the heavy wooden door of our rented house with books and food and cheap rosé and coffee. 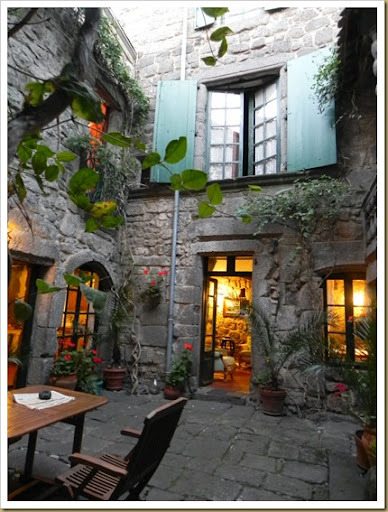 Beyond the courtyard door, I can hear the clip clip clip of the gypsy women’s heels and the chatter of their clouds of children as they walk from the rue Haute to the rue du Quatre Septembre. Inside, I’m lost in Bury Me Standing, Isabel Fonseca’s dazzling history of European gypsies. One of the good things about stormy weather (If you have spent more than five minutes on this blog, you may have noticed I am the Queen of the Silver Lining) is that it gives me a chance to make the kinds of warming, cosy dishes I rarely cook during our summers here, when we live on salads and grilled fish and fruit. The other day it was cold. Windows and doors rattled and strained against the wind. Shutters creaked. The air filled with the shrieks of seagulls, their wings the only bright flashes in the basalt sky as they circled overhead. It was also my lovely dad’s birthday, so I asked him what he would like for dinner, even though I knew he would say pork. When asked he always says pork, even though he greets everything I put in front of him as though it’s exactly what he wants to eat at that very moment. Sometimes even the least demanding souls should have exactly what they want, especially on their birthdays. I found a great recipe for rôti de porc aux groseilles in the May-June edition of Elle à Table, but I didn’t have redcurrants, or several other ingredients listed in the recipe. So I made my own version, using apricots, and then, a second time, cherries, both of which worked well. At least the birthday boy didn’t complain. But then, he wouldn’t. Season the pork well with salt and pepper. Warm the olive oil over a medium high heat in a large casserole and brown the meat all over, then remove it from the pan and set it aside. Reduce the heat, add the onions with the bay leaves and thyme and sauté until soft and translucent, about 15 minutes. Add the garlic and stir for another couple of minutes, then add the sage, honey, soy sauce, balsamic and wine or cider. Give it all a good stir, then tip in the fruit and return the pork to the pan. Bring to a simmer, cover with a tightly fitting lid and cook gently over a low heat for about an hour and a quarter. Keep an eye on it. You might need to splash in a little more booze or water halfway through, though I didn’t. 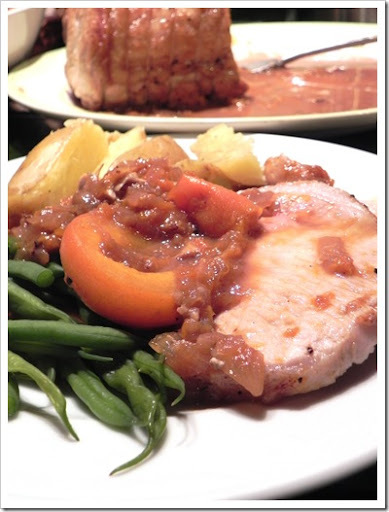 Serve the pork cut in thin slices with the sauce spooned over. The pork is also excellent the next day, cold, and sliced into salads or sandwiches.